I have been a United Church of Christ minister of progressive churches for over 14 years. I am currently serving Church of the Painted Hills, UCC in Tucson. I am also an retreat leader and author. 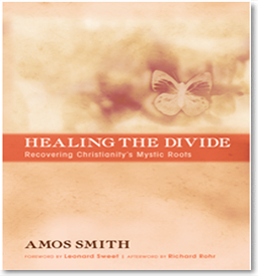 My new book is entitled Healing the Divide: Recovering Christianity's Mystic Roots. There are so many that narrowing it to two is challenging. Yet, I could probably settle for A Hidden Wholeness by Parker J. Palmer and volume 2 or The Philokalia compiled by St. Nikodimos of the Holy Mountain and St. Makarios of Corinth, published by Faber and Faber. Spirituality is ultimately about intimacy with God. I believe we are all hardwired for intimacy with God and that mysticism is more common than many think. We were all mystics as children and have lost touch. When intimacy with God returns, usually through diligent spiritual practice, it brings abiding peace, joy, and fulfillment, beyond what transitory sensory experiences can bring. 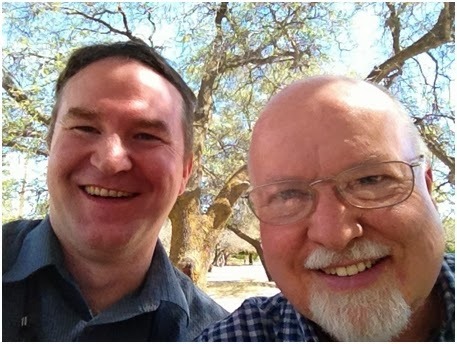 Pictured above is Amos with author Father Richard Rohr, who writes the foreword for Amos' book.